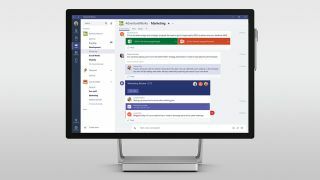 Microsoft Teams is now live and officially a part of Office 365, at least for those users with an appropriate business subscription. The software giant’s Slack-alike messaging and collaboration app has been in preview testing since last autumn, and has now been released across 181 markets globally. The service isn’t available to Office 365 Business subscribers, but is out for those on Office 365 Business Premium and Business Essential plans, as well as for those using enterprise plans (E1, E3, E5). There is no free offering, although no charge for the app either, at least not above and beyond what you already pay for one of the above subscriptions. The cheapest way of taking Teams for a spin, then, is Office 365 Business Essentials which will run you to £3.80 ($5) per user per month (billed annually). Microsoft noted that the likes of Deloitte, Expedia and Three UK have already been using the preview version of the service, among many other organisations. In the blog post highlighting the launch of Teams, Microsoft reinforced the fact that it provides a ‘modern conversations experience’ including threaded replies (replies to specific messages which then become threads, in the style of Facebook). The company also noted that a number of new features have been added since the preview builds, including support for audio calls from mobiles, and video chat on Android (which will soon be coming to the iOS and Windows Phone apps). Furthermore, it’s now possible to email a channel directly, and you can send messages that include attachments using this feature. Naturally, Microsoft is also pushing one of Teams biggest strengths, which is simply the fact that it’s integrated across Office 365 products and services. A load of further integrations are planned to make the service compatible with other third-party offerings, too, with integrations apparently due from SAP (SuccessFactors – for tracking goals and employee performance) and Trello. Expect bots from the likes of Hipmunk, Growbot and ModuleQ, as well.